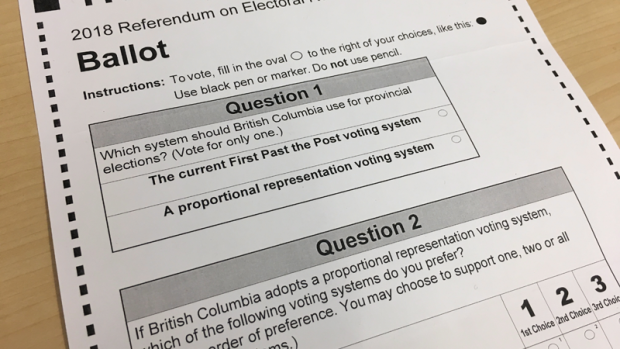 With just 10 days left for British Columbians to decide if and how they want to change the way they vote, a new poll suggests the province's millennials are more likely to favour proportional representation than their elders. In an online survey conducted by Research Co., 40 per cent of respondents said they would "probably" or "definitely" vote keep the current first past the post system, while another 40 per cent said they'd vote for a proportional representation system. Fifteen per cent said they were still undecided, and another five per cent indicated that they didn't intent to vote at all. Attitudes toward electoral reform were strongly tied to age, according to the poll. "A majority of voters aged 55 and over (57 per cent) hold extremely favourable views of the current system," Research Co. president Mario Canseco said in a statement. "In stark contrast, more than half of those aged 18 to 34 (53 per cent) prefer proportional representation." A majority (57 per cent) of those who said they'd vote to keep the current system cited confusion over the options on the ballot as the main reason for their decision. "Three-in-ten of these voters (31 per cent) also consider that the existing system is fair because candidates need to win the election in their riding," the release read. Voters have until midnight on Nov. 23 to request a ballot if they haven't received one. Elections BC must have received them back by 4:30 p.m. on Nov. 30—a process that has been complicated by rotating Canada Post strikes that have led to delivery delays across the country. As of Tuesday, about 24 per cent of eligible voters had returned their ballots, according to Elections BC's website. Voters in the referendum are being two questions, starting with whether the province should keep its current system or switch to proportional representation. Voters are then asked to rank three versions of the proportional representation: mixed-member, dual member and rural-urban. Not sure what the options are? Here's a quick explainer. The results of Research Co.'s poll are based on an online survey conducted between Nov. 14 and 16 among 800 adults in B.C. The data carries a margin of error of 3.5 percentage points, 19 times out of 20. Election referendum: Who wins and loses with different systems?